The 2012 Dark Days Challenge is upon us. Shannon, who is more motivated to participate in these sort of things than I, signed us up. And then today, she had a dinner failure. So, it falls to me to keep our end up. Good thing that we had a decent dinner tonight. Those Sundays when we eat left-overs, chips and salsa and scrambled eggs for dinner don’t really make for a very convincing blog about sustainable, local or organic meals….all winter long. During late summer and early fall the blog world is full of folks posting about eating local, 100-mile diets, 100-foot meals…ad infinitum. Now, I am not a complete zealot like the 100-mile folks. I am not going to run down to Scenic Beach and dip water out of the Hood Canal to evaporate and make sea salt. We grow and raise about 90% of what we eat and I cook from scratch much of the time – which upon reflection makes me sound sort of Amish which isn’t the case (the bonnet not withstanding) – but let’s just say we are less dependent upon the grocery store than the average family. Frankly, during that time of year I am too busy canning, freezing, picking, weeding, feeding, milking, and mucking to blog about what we are eating. I think about blogging a lot while I am doing those things! But until they develop the technology for me to plug a USB port unto my ear and download all those great blog posts composed in my head it isn’t happening. The really interesting thing about those days in the garden and nights canning and freezing is that I am doing all the time consuming and hard work associated with warm winter meals. Beans frozen in August take minutes to heat for dinner in December. Tomatoes blanched and canned in September make pasta dishes in minutes for mid-week meals – garlic harvested in July is Fettuccine Alfredo when I have a yen for something rich and creamy. So, as we kick off the “Dark Days Challenge” I thought it would be interesting to go back in time and take a look at the genesis of tonight’s dinner! Pork Chops – the last of the chops from a hog butchered last spring. 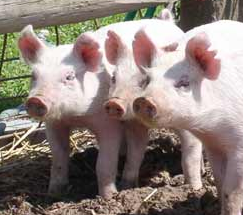 We buy piglets from a neighbor, fatten them on extra milk and grain and butcher about twice a year. We don’t buy any extra meat and eat out of our freezer all the time so we go through a whole hog, half a beef, 20 or so broilers and 10-15 stewing hens a year. 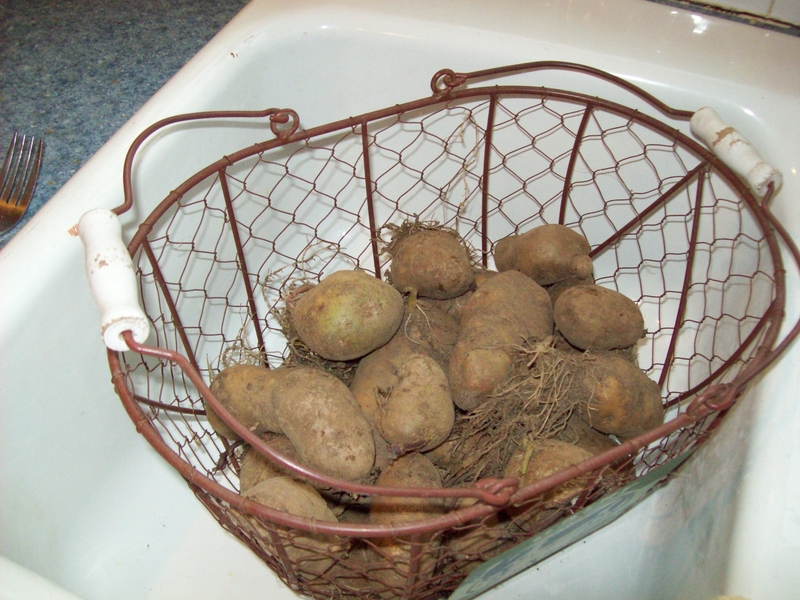 Smashed red potatoes – from the garden with fresh cream and salt and pepper. 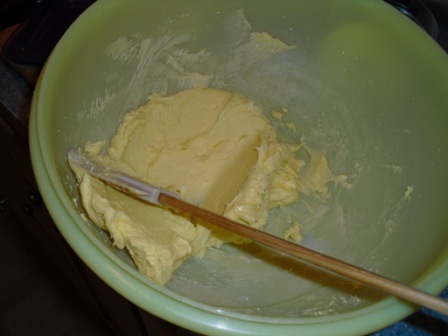 Milk gravy – pan drippings, milk and Shepherd’s Grain Washington grown white flour! Sauerkraut with apples and onions – we had great plans to collaborate on the ‘kraut this summer but the day we were planning on doing it I got side-tracked so Shannon made it. She jump-started the fermentation with whey from some homemade yogurt and it has a wonderful zing to it. The King apples were picked at my mom’s house right before Thanksgiving and the onions were from the garden. I season it with a bit of brown sugar, pepper and caraway and saute until caramelized. Very tasty. Applesauce – from Mom’s apples. I typically can 15-20 jars – need to get around to doing that. Pickles – dutch spears made from the abundant cucs we planted last spring. This is a refrigerator pickle recipe that I got from The Joy of Pickling. I only made a few because I didn’t know if we would like them. Need to make more next year! Sweet, tart and spicy! Green beans – from the garden. And the best part about this meal? It was a meal eaten around our family table with my husband and children, we were truly grateful for the bounty of our life, and were able to talk and laugh as we enjoyed the fruits of our labor. Regardless of whether your food comes from 100 miles or 1000 miles from your home, if you are unable to eat with the people you love, they are dark days indeed! Laura over at (not so) Urban Hennery issued her annual Dark Days Challenge – and regretfully I missed the deadline to sign up. I was spending more time back then farming than blogging. I think that was the weekend we were butchering turkeys…but that is a whole ‘nother Oprah! Shannon and I have been talking about a pantry challenge for this blog – but I am thinking that the Dark Days Challenge might be kind of fun too! The rules say that basically you need to eat four SOLE (sustainable, organic, local and ethical) meals a month. That shouldn’t be much of a challenge for us – given that we eat that way all the time anyhow! However – it will provide me with the incentive to plan, take pictures and blog about what we are doing – which is the bigger part of the challenge for me! 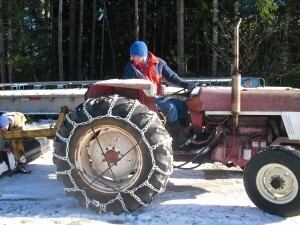 I spend hours working on the farm and compose great blog posts – in my head! But when the time comes to sit down at the computer and get it posted on the blog I just don’t seem to get there! 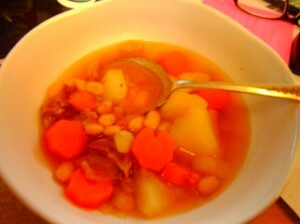 Tonight for dinner (we don’t have a picture of this because we ate it before I found out about the challenge!) we had broiled pork chops, rice pilaf, cranberry and apple compote, green beans and milk or apple cider. The pork was from a hog we slaughtered this fall, the pilaf contained scallions and carrots from our garden, and the compote included apples from my mom’s place and Grays Harbor-grown cranberries. The green beans came out of the garden last summer and went right into the freezer. The milk came from Alexis (The Princess Cow) and the apple cider was pressed this fall. With the exception of the rice, all of the food was Washington grown, most within 100 feet (let alone 100 miles!) of the house. For many folks eating local all winter long is a challenge because the Farmer’s Markets close down for a couple months, and even though Abundantly Green has their farm store open on Tuesdays and several other local farms offer winter CSA’s it is more challenging and you need to work harder to locally source fruits and veggies. In my case (and Shannon’s) winter is actually a time to take it easy. It is much simpler to open the jar and eat the contents than it was to put it up! We look forward to sharing of our meals during the challenge and hope you will share what you are doing with us! I know that this is the name of the Kitsap Decision Makers breakfasts – but it is also what is going on around here this week. Eggs first! I have 19 hens laying right now – and most of them have figured out how to use the nesting boxes in the coop – though there are still a couple that lay on the ground which is a bit tiresome and makes the eggs dirty. That is a dozen and a half eggs a day and even for a full court press holiday baker like me that is a bit much. Some friends and neighbors buy them but right now I have 10 dozen in the fridge! They are young hens, hatched in April, and I have lights on in the hen house to give the 14 hours of light so they will continue to lay during the winter. As we are closing in on the winter solstice it is starting to get dim as early as 4:00 most afternoons and it was just starting to lighten up at 7:30 this morning. I actually enjoy how nature imposes this winter rest upon us – giving us time to eat warm stews and sit by the fire reading Wendell Berry’s essays on farming – but doing chores in the dark twice a day is a bit tiresome. 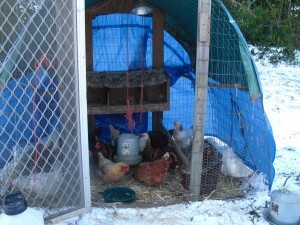 Visiting the coop and chatting with the girls in their safe and snug little home is comforting. They are cheerful and gossipy and only slightly resentful when I don’t let them out until at least noon. If I let them out earlier the number of eggs starts to fall off. I found three nests in the woods so far. I just have to remember that I need to leave at least one egg when I collect from them. Good things chickens can’t count! Now for the issues! The Kitsap Food and Farm Policy Council is reviewing proposed policies for farming in Kitsap County for inclusion in the Rural Chapter of the county Comp Plan. Look for more on this in the New Year. As we embark on crafting a set of thoughtful agricultural policies to guide planners and decision makers over the next decade your input is going to be very important. The Sun has done a good job of covering the “Year of the Rural” undertaking this year, so keep an eye out for information on farm policies! Found the camera! As my mother would say, “It was right where I left it!’ Of course, I used to hate it when she said that because it meant that I was still unable to find what I was looking for…. The hens were unimpressed with the snow. They spent most of their time fussing about in the new straw and didn’t even leave the coop. When they did come out they went right back inside because the snow was so cold on their feet. I have a mixed flock of 19 Delawares, Golden Comets, Rhode Island Reds and Cross-breds. Most days I get 14-16 eggs and we sell them to friends and neighbors. I have the chickens under lights to keep them laying during the winter and they will molt next fall. The coop is a livestock panel stapled to a wooden frame with wire fencing for the front and back of the coop. The door was $5 at the St. Vincent de Paul and the nest boxes were made out of scraps of OSB left over from building the house. Total cost was about $50. During the summer it is moved daily to give them access to fresh grass but from now until spring it will be parked on the garden and they will be bedded on straw. 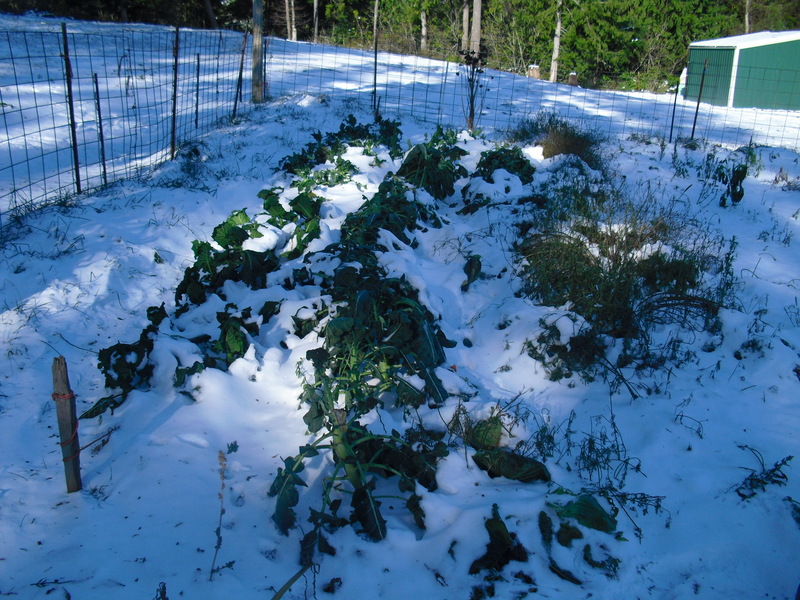 The snow did a good job of insulating the veggies that are still in the garden – about all that is left is broccoli and carrots. The broccoli was pretty much done but there were some side shoots still coming on. The carrots were fine under the snow and we had some for dinner on Thanksgiving. I need to get them pulled and put in the basement before we have another cold snap but like many other chores this fall, it didn’t happen because I was busy with something else! The Princess Cow (aka Alexis) was unimpressed with the white stuff. She spent most of the day in the cow palace munching on hay. She came out for some grain but wasn’t thrilled about how cold the water in the trough was. 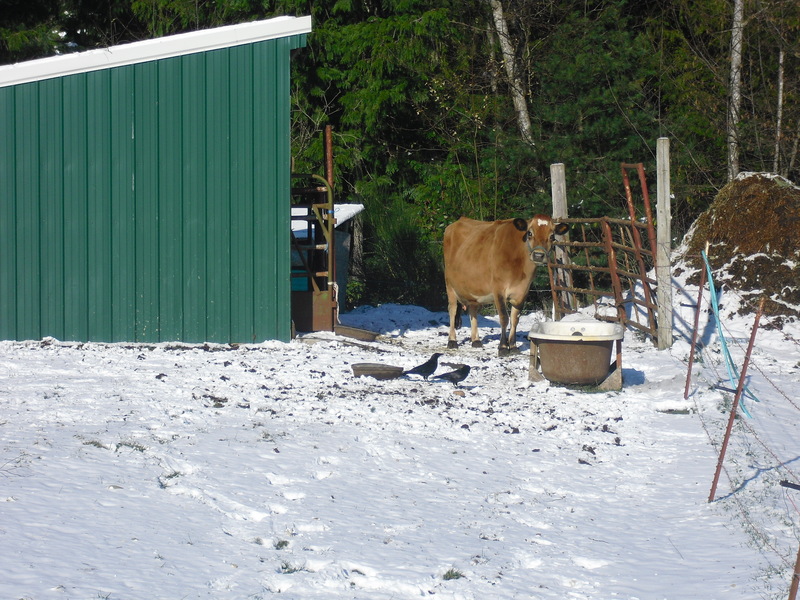 I had to pack water for her and the calf on Wednesday because the hoses were frozen. Typically I fill a 100 gallon trough and use it to water the animals during cold snaps. I also make sure all of the hoses are drained and ready to roll out for watering in cold weather. We have frost free hose bibs on the house and frost free hydrants in the yard. When the bathtub/trough gets low I roll out the hoses, fill it up and then drain them all. Tiresome but better than packing 5 gallon buckets. But, this time I got caught with my hoses full and they froze solid. I loaded up the utility cart with buckets and hauled it out to her. She drank 10 gallons and since milk is 95% water and she is giving about 4 gallons of milk a day that accounts for some of it but she was also grooving on the warm water! The kiddo was doing laundry when the power went out. I convinced her that frozen pants were better than having them sour in the washing machine waiting for the power to come back on. 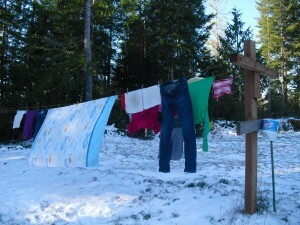 However, she REFUSED to believe that they would dry in the cold weather. They were on the clothes line all day and came in stiff as a board (which was very amusing for everyone) but when it started to thaw out in the house the clothes were only slightly damp. By this time the power was back on so we tossed them in the dryer. We had to bend the pants and stack them in the dryer but the only had to tumble for a few minutes until they were done. Kiddo was impressed (briefly) and since she is 14 and seldom impressed by anything her mother has to say right now, I made a note of it! The final pix is of my Better Half plowing the driveway. The chains were bought after we had so much snow two years ago. The tractor kept spinning out so we wrapped logging chains around the tires and through the spokes on the wheels. It worked but we didn’t have enough chains to completely cover the tires. We didn’t get to try the chains out last year (thank heavens!) but they worked a treat this year. Tirechains.com! Since I am making product endorsements – check out the boots hubby has on. They are kind of hard to see but they are “Muck” boots. I have a pair of the boots and some Daily Shoes in pink! They are awesome! If you have ever worn regular barn boots you know that there is nothing more bone-chilling than slipping your foot into a pair of boots that have been sitting on the porch all night. Even with felt insoles they are still cold and stiff. Mucks are a foam lined rubber boot that are warm and waterproof. If you have to be on your feet for long periods of time they have enough cushion to stay comfortable and they come in cool colors! They aren’t cheap but I wear mine every day and they are built to last! Pair them with a Peet Boot Dryer and you almost look forward to going outside on cold mornings! New kid on the block, that’s me! My name is Shannon Harkness and I have joined the force. The Farm Girl Force. I tend to wear a lot of hats. Wife, Mother, Friend, Farmer, Volunteer, Food Preserver (Instructor), Proponent of all Local Food, the list really goes on, but frankly it exhausts me to think of it. 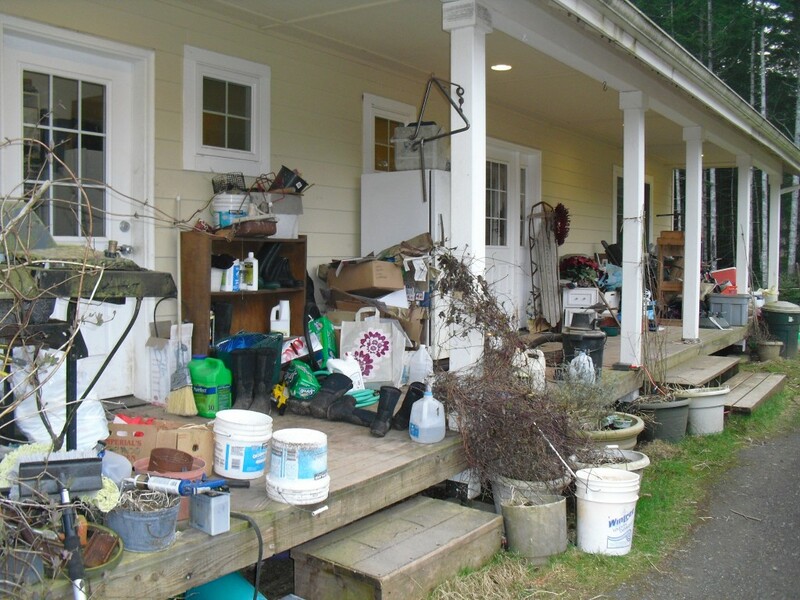 I hope you will enjoy reading about all things Kitsap Farmer, foodie, sustainable homesteader. One thing I really hope is that you will feel open to respond to our blogs and dialog with us. So, I’m gonna jump in and tell you what I am thinking. All of this blustery weather and lights flickering causes me to wonder about a few things. For instance, exactly how much extra time should I allow for chores on a daily basis when it comes to below freezing conditions? Can I really pawn off the chores on my three children? How well could they do it? And exactly where are my gloves? Luckily, our farm is situated by a large transfer station in Central Kitsap so our power loss is usually limited to a very short period. We do, however, take necessary preacautions, making sure we have enough fire wood handy, propane, gas for the generators, diesel for the outdoor heater in case snow should challenge our greenhouse or hoop house. And being a farmer and food preserver, we always have quite the bounty bursting out of our cupboards and freezers. Yep…that’s plural. Freezers. So, in the month of October I did a personal challenge for our family. I challenged us, myself really as I am the cook in the house, to eating entirely from our farm and cupboards for as long as we could. It was partly due to wanting to save a little cash and partly because I wanted to see how long we could go. It was a success…for two weeks. And then we went for a weekend getaway and I lost steam. But, it really got me thinking about if I could do it and how I would accomplish it if I HAD to. What I would stock up on and what was “fluff” was clear to me. I hope to share this challenge with you and want to know your thoughts. Are you ready? We are still defining parameters and thinking about the opportune time. More on that later. For now, I leave you to switch hats. Mother duties are calling…okay screaming annoyingly.